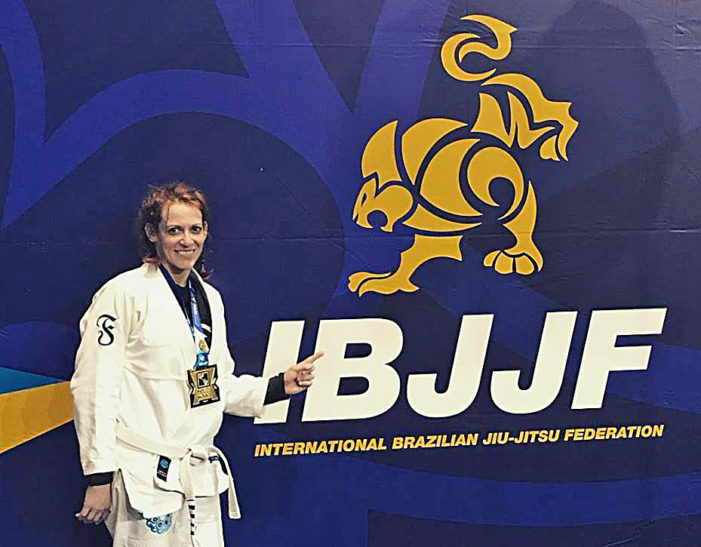 “I am a Pan American champion” were the words from April Thompson after claiming gold in the 2019 Pan Brazilian Jiu-Jitsu (BJJ) competition in Irvine, California. as the most prestigious BJJ tournament. The 34-year-old gold medalist, along with her husband Joey Thompson, not only raise four children in Guthrie, but also receives her training in Oklahoma’s first capitol. “She trains six to seven days a week in the gym, handles a house full of boys and homeschools all her kids,” Crystal Harvey said who owns and operates Top Tier Martial Arts along with her husband Heath Harvey. Top Tier Martial Arts specializes in Brazilian Jiujitsu and self-defense. Thompson quickly shared her appreciation for Heath Harvey for the training she has received. Thompson trained for the games for just over a year to win her division. With the win, she has now collected five medals, including four golds. Top Tier Martial Arts is located in downtown Guthrie at 107 W. Harrison.